Escape the summer heat this Eid Al Adha with a luxurious break in one of Giardino Group’s beautiful properties, Giardino Ascona or Giardino Mountain. 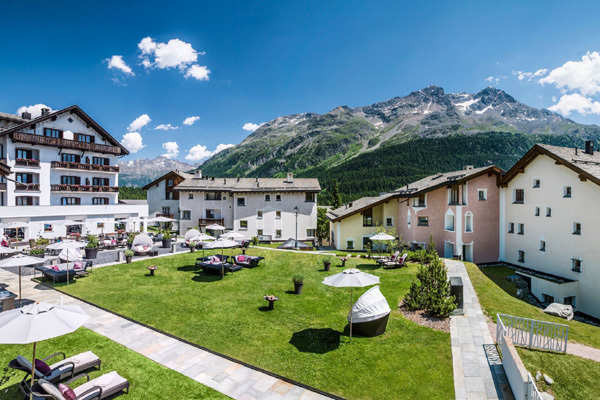 Located in Champfèr-St. Moritz, 1,822 metres above sea level, Giardino Mountain is a tranquil breakout retreat that has recently reopened for the summer season. Guests can recharge their batteries in any of the hotel’s 78 deluxe Alpine-style rooms and suites, with breathtaking views of the Engadine Mountains. Giardino Mountain combines a characterful design, a high level of service and a laid-back ambience to offer a getaway that is ideal for travellers of all age groups and preferences. Make the most of the mountain holiday by participating in a range of activities such as hiking, cycling, mountain biking and paragliding. Families can also make their holiday memorable by participating in a variety of exciting activities including surfing, sailing, boat trips, swimming, bathing in the Engadine lakes, windsurfing and rafting or golfing. At Giardino Mountain, guests can enjoy tantalising delicacies from Asia, the Middle East and the West at Hide & Seek restaurant or dig into regional specialties from the Engadine in a rustic ambience at Stüva. Room rates start at CHF365 ($377.8). The trendy Mediterranean-inspired Giardino Ascona is located in Ticino, the Italian part of Switzerland. The soul retreat is nestled in the lush parkland close to Lake Maggiore. Guests can unwind in any of the hotel’s 72 luxuriously appointed rooms and suites. The hotel combines a laid-back ambience, impeccable service and charismatic design to deliver the best guest experience. For the adventure-seekers, the mountainside is ideal for hiking, biking and paragliding while the lakeside is perfect for swimming, stand-up paddling and boat trips. Giardino Ascona is home to Ecco Ascona, a Michelin restaurant with two stars. Spearheaded by executive chef, Rolf Fliegauf, the restaurant serves rich aromatic cuisine. The diversified menu includes flavoursome dishes prepared using fresh local ingredients. In addition to this, guests will be spoilt-for-choice with the finest Mediterranean specialties at Hide & Seek Ascona. The restaurant also serves up Ayurveda-based dishes with a mix of Asian, Oriental and local influences. Giardino’s signature dipiù Spa is located in both the hotels and promises vitality, beauty, well-being and balance. An oasis for those seeking inner peace, the spa comprises an indoor pool, sauna, jacuzzi and fitness area. In addition, Giardino Ascona features an outdoor pool, nestled in the Mediterranean garden, complete with a pool bar. In addition to this, both hotels offer Ayurveda packages for holistic wellness experiences. Travellers can select from the Ayurveda Detox, Ayurveda Restart, Ayurveda for Expectant Mothers and Ayurveda Panchakarma Cure options along with a basic programme that includes Ayurvedic-focused full board and nutrition advice. To complete the experience, Ayurvedic treatments and therapies are provided at dipiù Spa.